This past Saturday night, a friend of mine from university celebrated his birthday at Joe Mamas in downtown Toronto’s entertainment district to enjoy a band that has residencies in two restaurants/bars in the city. The band is called Shugga, and they play a variety of Funk, Soul, R&B, and Contemporary selections. I brought along a few friends of mine to join in on the fun. When we arrived at the restaurant, we waited a few minutes to be seated. The place was somewhat small and was packed with diners and bar patrons. The colour scheme was red and black, with some music posters that creates an atmosphere that feels like restaurant/jazz & soul club. Lighting was minimal and all at a dimmed setting except for the stage. We were led to our table and seats, and eventually placed our orders. By the looks of it, most patrons were finishing up their dinner, so we were hoping to be served rather quickly. 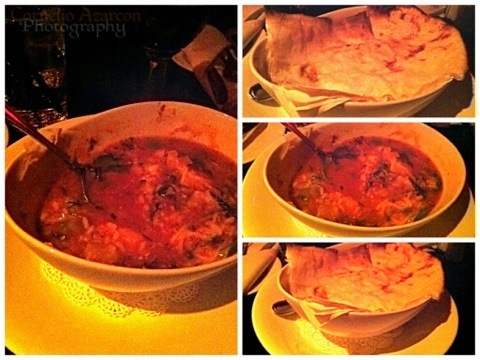 I ordered the étouffée ($11.95), which is a classic southern stew with lobster, shrimp and rice, baked with a phyllo crust. The stew was spicy with slices of jalapeños in it, which was well balanced with the heat not overpowering the beautiful aromas and various flavour notes of the dish. 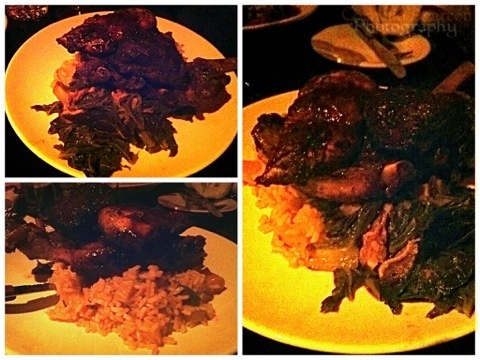 My main course was the Cajun Mixed Grill ($24.95), a variety of meats consisting of a 4oz blackened sirloin, 1/4 rack of baby back ribs, and 4oz BBQ chicken breast, served with a choice of two sides; of which I chose collard greens and rice. The ribs had a nice smoky flavour to it, but wasn’t as tended as I’d hope. The BBQ chicken breast was tender and had a nice smokey flavour as well. The blackened sirloin was cooked to perfectly to preference (which was medium), and was well seasoned and the highlight of the protein-packed plate. The collard greens were quite tasty, and is now in my list of favourite green leafy vegetables. Overall, the atmosphere was great, the music was very entertaining, the food was great, but the service was lacklustre. It took about 30 minutes to receive our appetizers, and 30 minutes after that for our main courses, which would not be bad if the waiter came by often and assured us that our meals were on the way or asked how we were doing. Yes, the restaurant was packed with a lot of people, but I think they’re used to it as it looks like a popular spot. I would really like to return to this restaurant, and hope that service would be better next time. If going for early dinner, I suggest to all in for a reservation.